Why the Kansas City Royals are actually the perfect Moneyball team. Ignore Ned Yost’s terrible reputation—Kansas City is a perfectly designed machine. 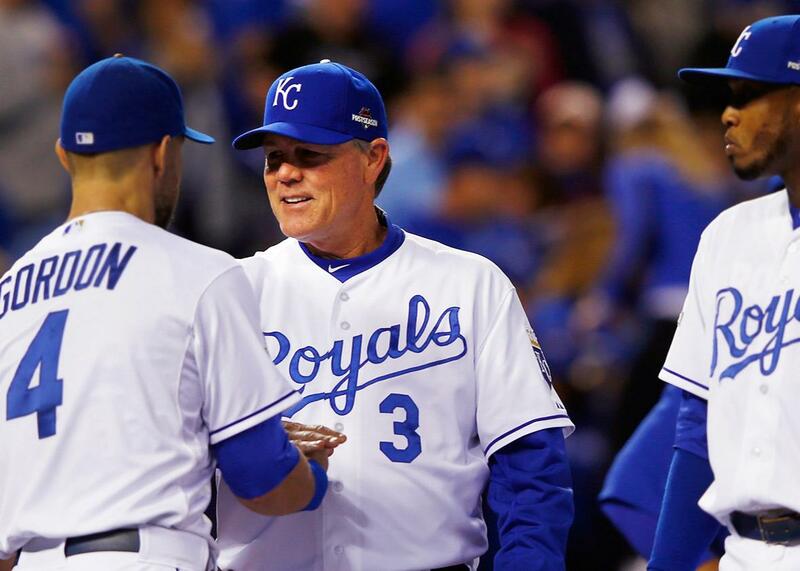 Kansas City Royals Manager Ned Yost, No. 3, prior to Game 1 of the ALCS against the Toronto Blue Jays on Oct. 16, 2015 in Kansas City, Missouri. The Kansas City Royals head into the World Series against the New York Mets with a distinction among recent American League champions: They are only the second AL team since 2001 to win consecutive pennants. So it’s fair to say that the Royals, chasing their first title since 1985, have built a pretty sound team. Yet, Kansas City—more than any other successful team in baseball—is often described as a throwback to a less enlightened era, one where the backward ways of a time before advanced statistics still reigned supreme. This is largely due to their manager, Ned Yost, who, earlier this month, was described in practically Neanderthalian terms by the New York Times Magazine. In a strangely loving piece, Bruce Schoenfeld argues that “the most criticized manager in the major leagues dismissed metrics and embraced failure” to lead the Royals to success. It’s also true that the Royals are built around speed, defense, contact hitting, and stellar relief pitching, all things that teams that follow the analytical dictates of Bill James, the authors of Baseball Prospectus, and other advanced statisticians decried as being overvalued in the late 1990s and early 2000s. Around that time General Manager Billy Beane built an Oakland A’s team around these ideas and despite having a payroll that was less than half of their big market competitors in places like Los Angeles, New York, and Boston, the A’s were regular contenders for seven seasons. Since Beane’s accomplishments were romanticized in Michael Lewis’ Moneyball and its movie adaptation, baseball teams have begun employing committees of statistical analysts, and an Ivy League MBA has become a better qualification to run a front office than a World Series ring. Several small-market teams like the Tampa Bay Rays and the Pittsburgh Pirates became regular playoff challengers on the basis of following Beane’s approach. In a span of less than two decades, Moneyball went from being some rebel philosophy to becoming the modus operandi of most teams. Then along came the 2014 Kansas City Royals. On July 24 of last season, they were 50–50—in the midst of a playoff drought that stretched back to that 1985 World Series win—and seemed en route to another nondescript season. Instead, the Royals won 39 of their 62 final games, mounted three jaw-dropping rallies in the Wild Card Playoff game to beat Beane’s A’s, swept the next two rounds of the playoffs, and took the San Francisco Giants—a team that had won two titles in the previous four seasons—to the deciding seventh game of the World Series before falling just short in the final inning. They did all of this with a team built on speed, defense, contact hitting, and relief pitching—traits supposedly anathema to Moneyball. But the idea that this team is some sort of 1960s throwback that is just getting by on grit, luck, and managerial tobacco drool is a false narrative. Yes, the Royals were tied for second in the American League in batting average (trailing first place Detroit by just .270 to .269), and second in stolen bases. Their bullpen boasted the best ERA in the American League and the fourth-best WAR. According to advanced statistics, the Royals have had the best defense in baseball for three consecutive seasons by a significant margin. So it sounds like the Royals are just really good in areas where teams long ago decided it’s less important to be so good. Which is exactly what Beane did with his millennial era Oakland A’s. But these days almost all teams value OBP and recognize that a patient hitter is superior to one who hacks away. The thing is that this statistical analysis wasn’t built around valuing walks qua walks, but rather advocating that teams with smaller budgets could be competitive by building around undervalued assets that bigger franchises were neglecting. The Royals are doing just that. Kansas City’s payroll, at the start of this season was $113.6 million, 16th in Major League Baseball. With elite veteran starting pitchers commanding well north of $20 million, it made sense for the Royals to develop a lights-out bullpen that would cost a small fraction of what top starters do. While building one of the best bullpens of all-time, the Royals have also designed one of the best defenses in the history of baseball—another asset that is not nearly as valued by their competitors. Finally, while it’s true that the Royals don’t prioritize walks (their 383 walks ranked last in the American League and second-to-last in all of baseball), they don’t strike out either (their 973 strikeouts was the lowest total in the majors, more than 100 fewer than second-place Atlanta and third-place Oakland). While it’s become conventional wisdom that strikeouts aren’t that bad anymore, the Royals are putting more balls in play than their opponents. This ultimately led them to the 11th best OBP in baseball despite walking nearly 200 fewer times than OBP leaders and defeated ALCS opponents Toronto. The pendulum has swung so that there’s value in a team like the Royals putting together players who hit really, really well for average and don’t walk as much. The larger point is that Moneyball was originally about roster construction and not game management. Even when you consider those day-to-day decisions, though, the Royals are not nearly as backward as they have been depicted. The team is about at the league average in using extreme defensive shifts. It also has one of the best advanced scouting operations in baseball, with Sports Illustrated making a strong case that scouting played an almost decisive factor in the team’s series victory over the Blue Jays. Despite Yost’s (sometimes legitimate) detractors, Kansas City is one of the finest examples of adapting the Moneyball ethos—which is to try to gain an edge on your opponents by doing things that they are not—to modern-day baseball.